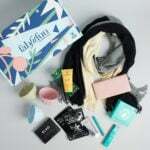 FabFitFun Editor’s Box – Available Now! If you haven’t signed up for FabFitFun yet, use coupon code MSA10 to save $10 off of your first box! Check out our FabFitFun reviews and FabFitFun Spoilers to see what you can expect from this subscription! This will be the first box I haven’t received since I first started with the winter 2017 box. I have just about all of these items already and some I have are multiples. Also since I don’t get to customize it’s not worth the risk of getting more items I don’t want or need. I would have chosen the brush set and Elemis. Thanks FFF for saving me $49. Not mad at all. Thankful for no FOMO. Same here. I already have… three(?) of those eye masks!! Enough already!!! Glad I saved the money for more stuff in the Edit sale!! Haha! Thanks for letting us know. Looks like the box they offered for sale for current subscribers is different than the one for new subscribers. I’ve updated the post! Current subscribers had the same yesterday (Cylo earbuds) but then disappeared from the shop altogether. Not sure what that’s about. I resubbed based off the skyn product being in this box and they switched it to the earbuds without notifying me. The skyn product was listed in the resubbed email they sent me. When I reached out to c/s they didn’t do anything just said that the earbuds go to the 48 states and the skyn goes to the other two and Canada. I’m upset.